This year's carnival featured two a-MAZE-ing bouncy houses, numerous games and a cake walk that people will write poems about for years to come. THANK YOU to all of our sponsors: Roche Harbor, Heritage Bank, The Tooth Ferry, Brandli Law, Kiwanis and David L. Waldron - Architect. Thank you as well to our hard working volunteers: PrintOnyx, Friday Harbor Drug, Leos, and many, many individuals who helped with the setup, running the booths, and tear down. It's a hectic, lighthearted fun! It's also wonderful to come together for a day to raise some money for Island Rec and see all of the smiling faces. Island Rec opted to celebrate it's 30th Anniversary at Movies in the Park with photos, contests and Ghost Busters (which is now 30 years-old as well -- yikes!). This casual and oh-so-fun series was made possible by FANS, expanding to 6 weeks in the late Summer and Fall. Island Rec's FANS from all over came to celebrate. Many left with prizes and free popcorn (thank you, ACE Hardware!). Island Rec turns 30 this ye﻿ar and is throwing it's 24th Children's Festival. FANS is proud to be a sponsor of this year's event, as it has done annually since its inception, providing free balloon animals, hats, flowers, and general good cheer. Check out how much fun we were having!! An event for the whole family, Seattle’s Museum of Flight brought their traveling planetarium to the island. Local telescopes were also on hand to view the full moon, Jupiter, Mars, and several galaxies. FANS was a proud sponsor of this Island Rec event. FANS hosted this year's Carnival at the SJC Fairgrounds. The 2nd annual FANS Carnival offered some good old fashioned family fun! Kids raced through the 38’ long inflatable Wacky Jr. Obstacle Course and bounced/slid down the 17’ inflatable slide. Twenty different game booths and lots of prizes to win kept the whole family warm and smiling on a cold November day. Admission was free and tickets cost $1 each. All booths cost a single ticket and turns on an inflatable only cost two. FANS and Challenger Sports present FREE drop-in soccer clinics for kids ages 3 to 12 on Saturday, June 22, 2013. Coaches from the British Soccer Camp program will be on hand for these fun filled clinics at the Friday Harbor Elementary School fields. No advanced registration is necessary, but waivers will need to be signed by a parent guardian, so plan to arrive 10 minutes early. Family and Neighbors Support Island Rec (FANS) will be giving away dozens of pairs of roller skates to anyone who wants to rollers skate Skates size range from kids through adults and all are in good working condition! The give away takes place on Saturday December 15 from 10am –noon on a first come first serve basis at Island Rec’s office at 580 Guard Street. Doors open early at 9:30am for FAN Club members. FANS was established in the spring of 2012 and is an organization with a mission to enhance park and recreation facilities and programs for San Juan Island residents by promoting goodwill and broadening the funding base of San Juan Island Park and Recreation District. With new skates in hand you will want to head to Island Rec’s Open Skate night held Saturday night 7-8:30pm in the Fair Building! 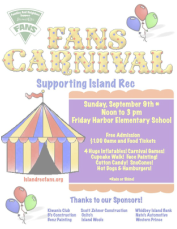 FANS presents a family carnival for kids of all ages at the Friday Harbor Elementary School. Bouncing inflatables, games, food and music make for a perfect Fall day! We'd like to give a special Thank You to all of our business sponsors who helped make this happen... Kiwanis Club, B's Construction, Benz Painting, Scott Zehner Construction, Osito's, Island Wools, Whidbey Island Bank, Nate's Automotive, and Western Prince! FANS and Challenger Sports are presenting FREE drop-in soccer clinics for island children at the Friday Harbor Elementary School fields. Professional coaches from the British Soccer Camp program will be on hand to lead the training. Parents! Please plan to arrive 15 minutes before each session to sign liability forms.